Horse Flies, Deer Flies and Green Heads are of the Tabanid family. * These Bad Boys (actually Bad Girls since the males don’t bite) are the largest flies with the most painful bite. Horses hate these flies and will do anything to get away from them. Since they are water breeders, Fly Predators cannot stop their reproduction. 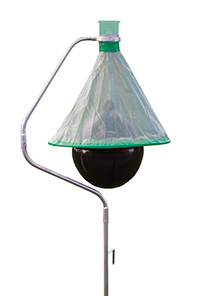 The only control available are specialty traps that are designed to attract Tabanid flies. Place the H-Trap in a sunny area between the source of Tabanid Flies, typically ponds and streams and your animals (and beyond your animals’ reach). Horse and Deer Flies are attracted to the dark ball, thinking it is an animal and blood meal. When the flies hit the ball, they fly up and get trapped in the collection cup at the top. Note this trap only gets Tabanids. One H-Trap will cover a 5 horse outdoor paddock of about 2.5 acres. This trap is sturdy, chemical free and with its one leg, is easy to set up and move. It’s UV resistant, wind stable with a gyroscopic upper bracket and anti-rotation ground anchor. Assembly is not difficult and it has a two year warranty. It will last for years if brought in during winter and high wind storms. 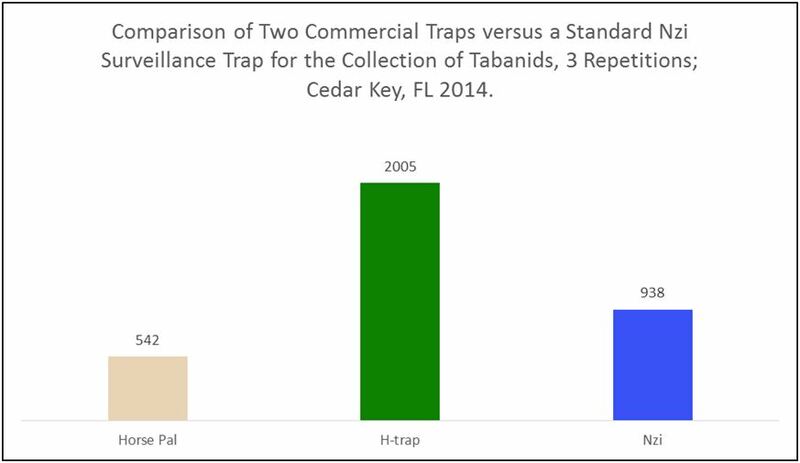 The USDA tested the H-Trap in 2014 and found it collected almost four times as many flies as the Horse Pal trap and over twice as many flies as the Nzi trap. * For more information about Deer and Horse flies check out our Fly Control Guide.